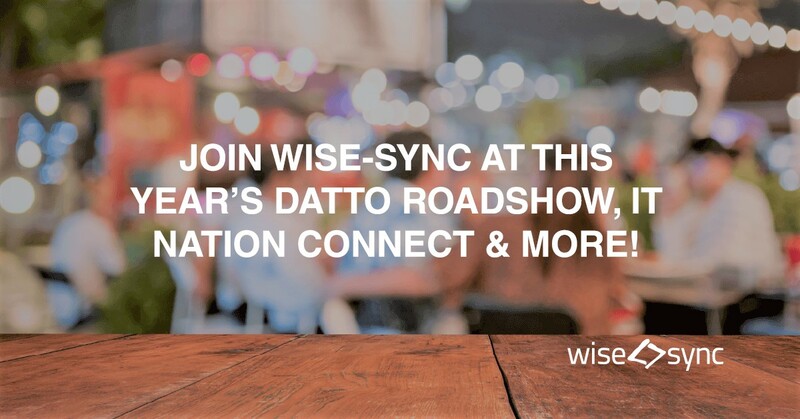 Join us at the Datto Roadshow, IT Nation Connect and more! It's that time of year when the Wise-Sync team venture out to join some of the industry's finest with a whole heap of talks, canapés and drinks, and you already know, after the show, it's the after party (Datto's CHANNEL LOVE), so if you're headed to the Datto Roadshow, IT Nation Connect or Channel Love - come join us, we'd love to see you! Where: Sydney, Melbourne, Brisbane, Perth, Adelaide. Datto, a distinguished provider of IT solutions delivered by Managed Service Providers (MSPs), presents their annual event 'Datto Roadshow', which showcases their cutting-edge, enterprise-grade technology, exciting product updates and in an all-time first, their MSP Blueprint Series (MBS), before winding down with drinks, appetizers and more. For tech industry leaders and professionals alike, you won't want to miss IT Nation Connect. This premier event, brought to you by ConnectWise, spans across three action-packed days with industry talks, invaluable product insights and wonderful networking opportunities. Hosted in the heart of Surfers Paradise at the luxury Marriott Resorts & Spa, IT Nation Connect promises a thought-provoking and compelling agenda of themes, specially designed to position you for success. For those attending IT Nation Connect, you're in for the ultimate opening night celebration with the CHANNEL LOVE Party. Just as its name suggests, there'll be drinks, pizza, laughs and of course, a whole lotta' networking love! For the cherry on top, each attendee scores an entry into winning a FREE trip to DattoCon19 Paris! All you need to do is register online at the link below, bring a business card to gain entry and may the fun begin!